We enjoyed our time in Fredericton and the people are very friendly. Fredericton is only about 10 minutes away so it is close to shopping. 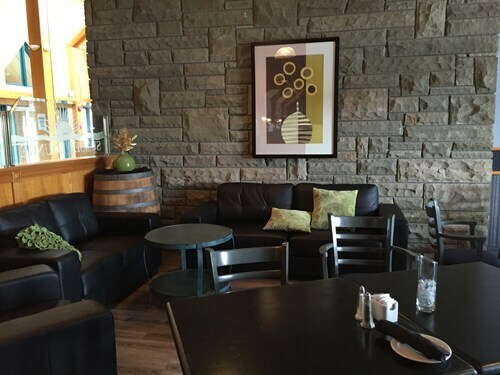 It is located 15 to 20 mins from the city of Fredericton. Looking forward to more downtown hotel choices in Fredericton next visit! Very friendly staff and we were provided and upgrade when we arrived which was very nice as we were in Fredicton with a family member who just had lung surgery. Property was great. You can tell it's fairly new. Kids loved the water slide and pool! Rooms are nice and big. Breakfast was good lots of variety to choose from. Where to find Fredericton hotels near an airport? Where can I find hotels in Fredericton that are near tourist attractions? 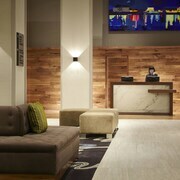 Travelers in New Brunswick who are looking for quality hotels in and around Fredericton have a range of options. Currently, Expedia's extensive database features 19 hotels and apartments within a 0.1-kilometre (0.1-mile) radius of Fredericton's heart. 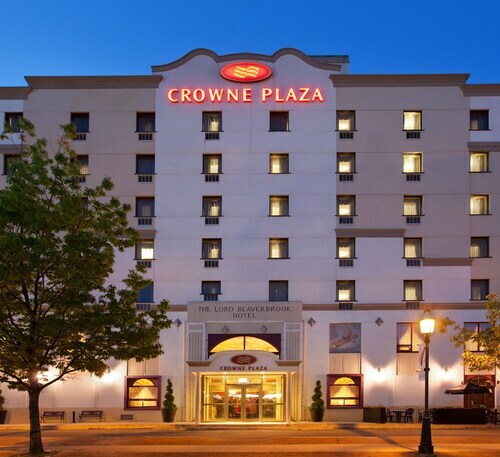 A terrific option if you want to stay close to the center of Fredericton is the Crowne Plaza Fredericton-Lord Beaverbrook. The Delta Hotels by Marriott Fredericton and Crowne Plaza Fredericton-Lord Beaverbrook are conveniently close to the University of New Brunswick, while the Best Western Plus Fredericton Hotel & Suites and Comfort Inn are situated near Odell Park. 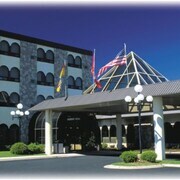 Accommodations near Wilmot Park include the Fredericton Inn and Howard Johnson Plaza Hotel Fredericton. 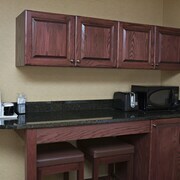 Alternatively, if you are interested in staying near Reading Street Park, your closest hotel options include The City Motel and Skyline Motel & Campus Inn. 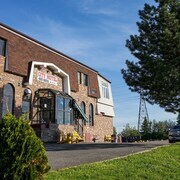 3 kilometres (2 miles) from downtown Fredericton, is the Ramada Fredericton. 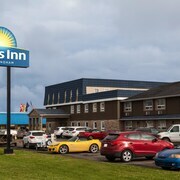 The Days Inn and Conference Centre - Oromocto is located 17 kilometres (11 miles) away. 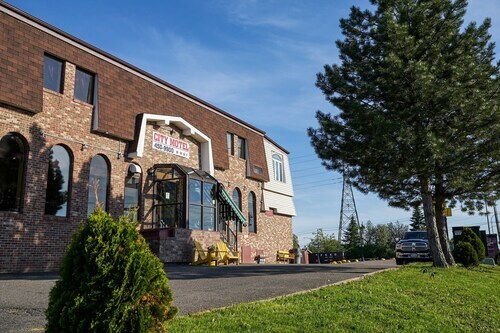 The Riverside Resort & Conference Centre and also the Holiday Inn Express & Suites Fredericton are alternative Expedia-listed accommodation options in Fredericton. Looking for things to do? Why not spend a few hours exploring the Carleton Civic Centre and the Carleton County Historical Society in Woodstock, 80 kilometres (50 miles) to the west of Fredericton. Expedia-listed Woodstock accommodation options are the Best Western Plus Woodstock Hotel & Conference Centre and Knights Inn Woodstock. 90 kilometres (56 miles) to the southeast of Fredericton is Saint John, home to the Hilton Saint John and Delta Hotels by Marriott Saint John. Reversing Falls and the Saint Joseph's Hospital are a couple of the popular sites to see should you visit Saint John. St. Andrews is a major city situated 100 kilometres (62 miles) away from Fredericton. It is home to the Minister's Island. This area of New Brunswick has a number of hotels, including the Algonquin Resort St Andrews by-the-Sea Autograph Collection and Picket Fence Motel. If you choose to fly into Fredericton, Greater Fredericton International Airport is a logical airport. It is 13 kilometres (8 miles) from downtown. Travelodge Fredericton is nearby. What are the most popular Fredericton hotels? Are there hotels in other cities near Fredericton? What other types of accommodations are available in Fredericton? Explore Fredericton with Expedia.ca’s Travel Guides to find the best flights, cars, holiday packages and more!